It couldn’t have been easy for Auburn to believe that they could win against Kentucky today. Chuma Okeke, the hero of their Sweet 16 win over North Carolina, tore his ACL in that victory, and even with their sophomore center, the Tigers wouldn’t have been favored against a Wildcat team that had beaten them twice already this season. 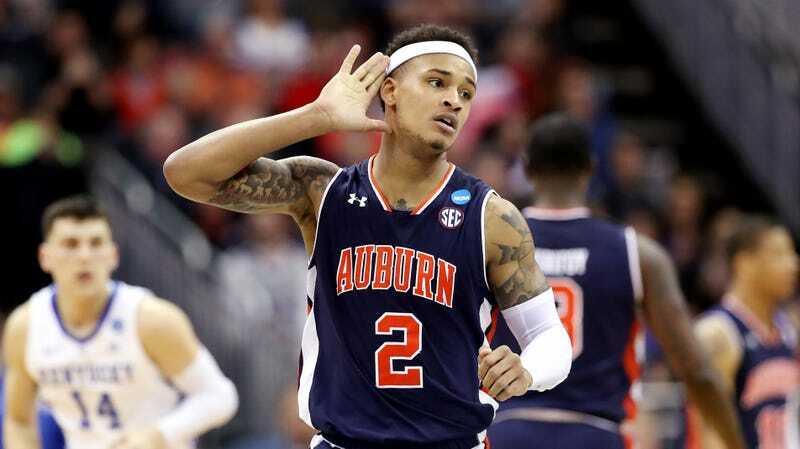 But in Okeke’s absence, the backcourt duo of Bryce Brown and Jared Harper came up huge for Auburn, leading the Tigers to their first-ever Final Four. Brown and Harper combined for 50 points, and were the only Tigers to cross double figures. Because of them, Auburn outlasted Kentucky in overtime, 77-71. However, the biggest possession of the game didn’t involve Auburn’s highly regarded offense. Rather, Kentucky got absolutely stuffed multiple times at the rim in the final seconds of regulation, first by Horace Spencer and then by Anfernee McLemore. That preserved the tie and added five extra minutes to the clock. It was Harper who took over in OT. The point guard scored 12 and hit all his free throws in the final minute, keeping Auburn in the lead for the entirety of the last four minutes. This gravity-defying lay-in pretty much sealed it. And, not because it was an enormous play in the grand scale of things but just because it was cool as hell, here’s a sick block and a pose by Malik Dunbar to snuff out a Kentucky fast break in the second half. Auburn will get the suffocating Virginia Cavaliers in the national semifinal.